As part of its partnership with the University Hospital of Bordeaux, and with the collaboration of Dr François Picard (cardiologist at the University Hospital and at Haut-Leveque hospital), the SimforHealth team have developed a series of clinical cases specific to cardiology. The case presented in this article is a virtual clinical case split into 5 consultations, spread over “6 years in the life of the patient”. It enables both aspiring and currently-practising health professionals to train in this sort of situation via our MedicActiV platform. 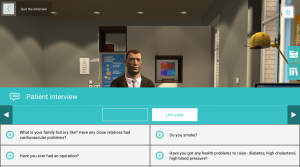 Once connected to MedicActiV, you will find Mr Plantier, your virtual patient, specially created for this case, who is consulting a family physician following a request from his company to have a preventive health check-up. It turns out that Mr Plantier does not have a personal family physician and has not been seen by a doctor for 15 years. “You can see, I am fit”, he jokes. The first consultation starts with taking the patient’s history. All these questions, written by Dr François Picard and entered into our authoring tool with the help of our teams, allow the learner to practise speaking with the patient. 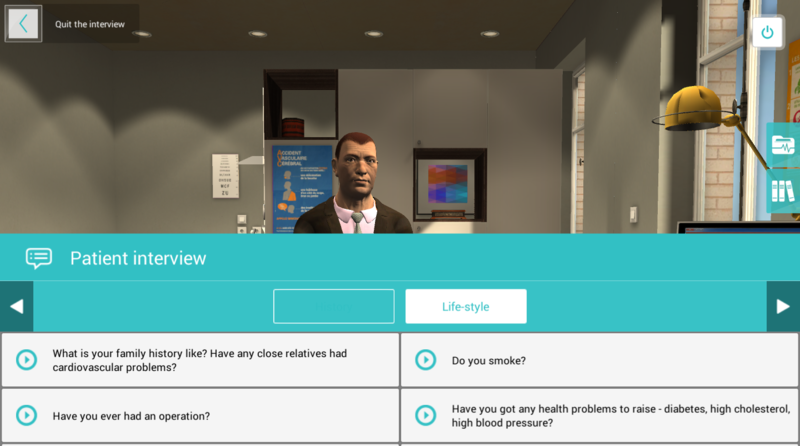 During this first consultation, a clinical examination will also be carried out on Mr Plantier by “you”, the health professional, but in a virtual manner. 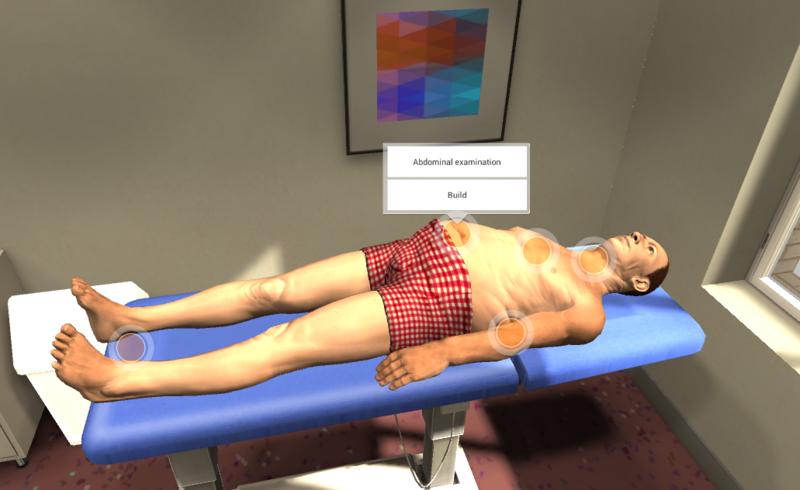 Procedures such as palpating the abdomen, or taking a blood pressure reading, are played out in digital simulation, thanks to our MedicActiV tool. All through the various consultations, you can access the patient’s medical file, find out his surgical history and his life-style, and acquaint yourself with the blood tests and x-rays which you have requested. At the end of the consultation, a quiz will allow you to check your answers, and if negative, corrections will be provided with comments from the case author. At the end of the case, which takes around 30 minutes, you will find all the questions and actions taken during the consultation. To perfect your training, you will have available the answers, as well as complementary explanations plus literature and on-line references. To discover mister Plantier’s pathology, create your account on our platform MedicActiV within 3 minutes and take advantage of our 4 months of free trial on more than 6 clinical cases available for free. Discover how does the case look like and take care of M Plantier. Follow all our news on Twitter too! Previous Previous news item New clinical case with Stanford, a vascular medicine clinical case using virtual reality. Next Next news item MedicActiV will be presented at the SESAM 2017!